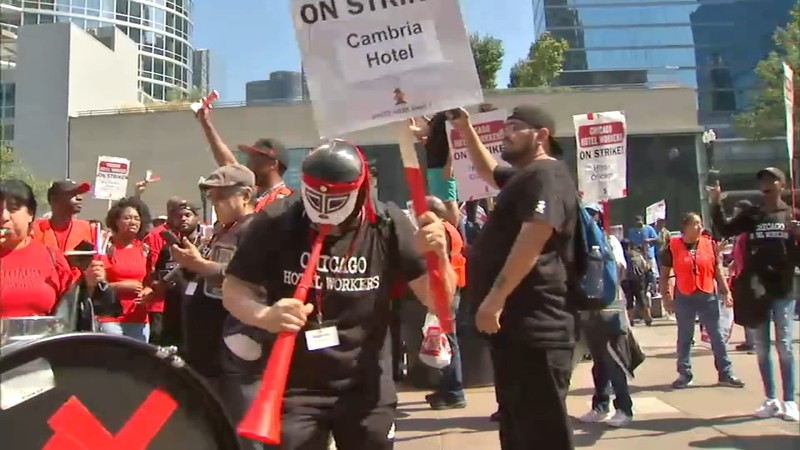 CHICAGO (WLS) -- The union representing thousands of downtown hotel workers announced Thursday they have reached an agreement with Marriott. UNITE HERE Local 1 said via Twitter they have reached agreement with Sheraton, W City Center, W Lakeshore, Westin Michigan Avenue, Westin River North, JW Marriott and Hotel Blake. Workers are still on strike at 19 other hotels in the city. The workers include housekeepers, servers, cooks and doormen. They were striking over year-round health care and wages. UNITE HERE Local 1 President Karen Kent said in a statement, "On behalf of striking members of UNITE HERE Local 1, we wish to thank the members of the Chicago Building Trades, the Teamsters, the Elevator Constructors, and the Chicago Federation of Labor for honoring our picket lines." Workers walked out on the morning of September 7 after more than 3,200 UNITE HERE Local 1 members voted to authorize a strike and 97 percent voted yes. Their current contract expired August 31. In a statement Thursday, Mayor Rahm Emanuel said, in part: "I want to commend the members of UNITE HERE Local 1 and Marriott for staying at the table, working in good faith and reaching an agreement that reflects their shared interests. This agreement is a significant step forward for the union, the hotels and the city and I am confident it can light a path forward to ending the labor action at other hotels in the city."